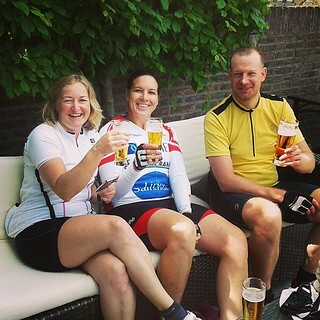 In the last week of May, I rode my bicycle from London to Brussels stopping in Amsterdam and Turnhout on the way. The ride was in aid of Make-A-Wish, a children’s charity that grants children with life threatening illnesses their dreams. From a personal perspective, I was very pleased with the ride. I did not have to walk up any hills with the bike and I logged some good average speeds. I stopped riding a bicycle when I was 17 after learning to drive a car. I could not bring myself to ride a bike after seeing how they are overtaken on the roads. I bought a hybrid bike in April 2011 after researching cycle lanes as an alternative way to get into work. I won’t repeat all the details on the progress that I made since 2011 with my health (you can read that here) but buying the bicycle was fundamental in reducing my weight from 102kg to below 80kg. Last year, I upgraded to a road bike and eventually took my hybrid bike to Prague where I travel frequently for work. I used the hybrid bike to train for the Brussels ride on the bike in Prague. The gears have never really worked on it properly but I used it to practice hill work. Strava had some good challenges in May and one of them was to ascend 2300m in 6 days. I managed to complete the ascent challenge that was very good training for the ride. We started on Wednesday 28th May in Stratford, East London. I had intended to get there by train, but as usual I packed too much stuff, so I took a taxi. Immediately I met 3 people who I would be in contact with during the ride – Donna, Matthew and Steve. We set off through the London traffic – to begin with, the proximity of the other cyclists feels a little claustrophobic. Some of the less experienced riders appeared to be a bit nervous and unsure on the road. Once we had got through Walthamstow, the pack separated out. In what felt like no time at all, we were at the first water stop. The weather was not particularly pleasant as it was raining but it was not drenching us. After a lunch of pastas, salads, meat and sausage rolls, I got a good energy boost and rode with Donna. We ended up on a country road that was not particularly nice for a road cyclist. Road bikes have narrow high-pressure tires and should not really be taken off road (okay, okay, many of you will argue about this, but I avoid off-roading on a road bike). The road had a lot of gravel and debris. In fact, think of the film Gravity, forget Sandra Bullock for a minute and imagine all the debris flying around in the film. I think all of it was on this road. Furthermore there were stinging nettles either side. Not pleasant. At the top of the road, we met Graham. Graham was already the highest performing member of the Strava group for the ride and as usual it felt bizarre to know him but not have met him… The Internet is good for that. One of Les Roulers fixes his bike. We carried on, hit a similar road and then went on a road that had recently been re-laid with loose gravel. Donna needed to stop to eat some food and it was at this point I noticed that I had a puncture. In the rain. Due to me being exceptionally rubbish at mechanics, Donna started to repair it for me. There were a bunch of six chaps (Les Roulers including Gary Goldsmith) on the ride with matching gear and several of them were very good riders. Three of the crew stopped to help with the puncture and together with Donna got me back on the road. I could not get the tire up to a high enough pressure but got it to high enough that I could continue riding. Actually earlier in the day I had passed Les Roulers having a crafty half of Guinness at a pub just below a hill. They had an aura of fun about them and I had to chuckle as I cycled past. That got me up the hill. Unfortunately the new tube was faulty. Donna decided to go to the next water stop and I called the mechanic. I had run out of spares. It was frustrating waiting but I eventually calmed down – I had plenty of time to get the ferry at Harwich. Kenny and Steve turned up and did a fantastic job. I was back on the road properly. I stopped briefly at the water stop and pressed on to the holding point. 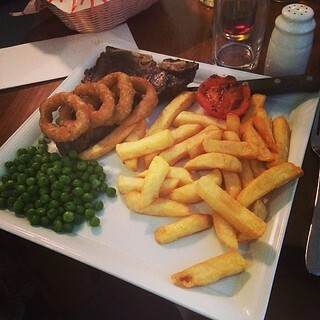 I met Donna, Graham and Shona, and ordered the biggest steak available. We were later convoyed to the Harwich ferry and I showered and went to bed almost immediately. Around 630am, there was a very kind announcement telling us all to get up. Given that I was about to get grubby, my morning routine was simply to apply Vaseline (before you ask, you need to use Vaseline for a long ride to prevent soreness and rashes), put on my bike gear and pack up. I headed for breakfast and decided to carb up. I had 5 hash browns, bacon and eggs. I could not get going on Thursday and I think the reasons are simple: 1. the hash browns were the wrong carbs (or rather too much fat), 2. I didn’t sleep very well and 3. I didn’t have a coffee. We set off from the ferry to a holding point and from there started to cycle up the coast through The Hague and then took a right hand turn to Amsterdam. The weather was not fantastic – it was quite windy. No punctures. Some of the trip is a blur to be frank. I cannot remember the exact point where we got together, but I ran into Donna again and she was riding with Bob and Reggie. Bob and Reggie are from Guernsey and were riding for a cancer charity along with 4 others. I rode with these three for the rest of the ride. When I could keep up with them that is. Very nice people indeed. The cycle lanes in the Netherlands are fantastic. You cannot beat them. They segregate the riders from the traffic. Furthermore, the law favours the cyclist and the car drivers are respectful of the cyclists. However some kind local had removed the markers between Haarlem and Amsterdam, and a couple of us got lost. We simply followed the cycle path to Amsterdam and picked the official route up again. I skipped the evening meal and met two of my friends in Amsterdam at a food festival. It was a public holiday in the Netherlands (Ascension day) and they had been tracking my progress on Apple’s Find my Friends app. I cycled through the centre of Amsterdam, got to the hotel, showered quickly and met them. We ended up having a Chinese at Nam Kee on Nieuwmarkt. On day three, the weather was brilliant but we had 182km of cycling to do. At the time, this was the most I’ve every ridden in a day. Most of it was flat. On the road, I was passed by Keith. Keith was one of the Strava group and is a good rider. He lives in Scotland and does long rides for breakfast. I was determined to keep up with him but it was impossible. Matthew was not doing so well by the third day and his knee was playing up. It was a common complaint amongst the riders. One of the Guernsey crew, Amanda, has had both her hips replaced and had no trouble with them. Her knee stopped her from finishing on the last day – it must have been very frustrating for her, but she made a very good effort indeed. Keith’s brother Shaun also had an issue with his knee – I was carrying some cold spray that seemed to help him. He was better by the end of the day. My knees were definitely stressed but the cold spray and knee supports I brought along were used by other people. I did use a bit of spray on the last night, but not during the ride. Also I did not use any gels or isotonic drinks. I just used food and drink at the stops. There was a lovely couple on the ride – I’m afraid their names escape me because I’m useless. I was riding with them for a bit on day 3, but shot off ahead. I’d got lost with Shaun and we were making our way back to the route when we passed them. Unfortunately one of the couple had a broken shifter and he had to finish the ride on a loaned hybrid bike. Donna, Bob, Reggie and I rewarded ourselves towards the end of day 3 and stopped for a beer. What a welcome stop that was. On the fourth day, we had 100km or so to complete, but the stress of the ride was over for most of us. The cycle paths are not as good in Belgium and we were not aware of the rules there. In places one is only allowed on the cycle path and not on the road. I got bibbed a few times but others were pulled across by the police. We soon got the message. The worst bit were the cycle lanes that were two way but on the left hand side of the road. When faced with an aggressive cyclist coming toward you, the only way place to go was into the oncoming traffic. Highly dangerous. There were more inclines in Belgium and I felt it. I’m glad I did the hill work practice the week before, but it’s safe to say that one can never do enough hill work. Donna flies up hills – she lives in Wales and is used to it. I’d lost my power on the fourth day and I think it is because I did not have a particularly good night’s sleep. When we got to Brussels we were convoyed to Grand Place where we congratulated each other and took photos. We went back to the hotel, had a celebration dinner and some went out for drinks. I didn’t – I was in bed at 2330 where my head hit the pillow and I slept constantly until 800. I went down for breakfast, met the team and we decided to go back to Grand Place where we had champagne, lattes and waffles. That was a fantastic end to the trip before Eurostar’ing it back to London. Thanks to Reggie for the picture of me in Grand Place, Brussels.